This post has been edited after its first publication, to reflect some users' comments and changes in the application. In this post, we will see how to get three of the statements required by the IFRS: the Balance Sheet, the Income Summary and the Statement of Changes in Equity. We will also recap how to record transactions, how to see transaction analyses, how to have a look at the general ledger and at the trial balance, etc. Financial Accounting, by Henry Dauderis and David Annand (ISBN 978-0-9936701-0-7), which is released under a Creative Commons License, Attribution–Non-commercial–Share Alike 4.0. The second chapter of the book, The Accounting Process, explains the meaning of accounts, what is a transaction analysis, and how to use formal accouting records. If we want to follow the example of the book, we can start by forking (duplicating) the provided "Basic Canadian Corporation", which already has the complete set of accounts and the configuration needed. After confirming the creation of the new firm, we can change the settings (the name of the firm and the comment, for instance). With our brand-new firm, we can have a look around. Of course, since the journal is empty (there are no transactions recorded), the statements will be empty, and so will be the general ledger and the trial balance. 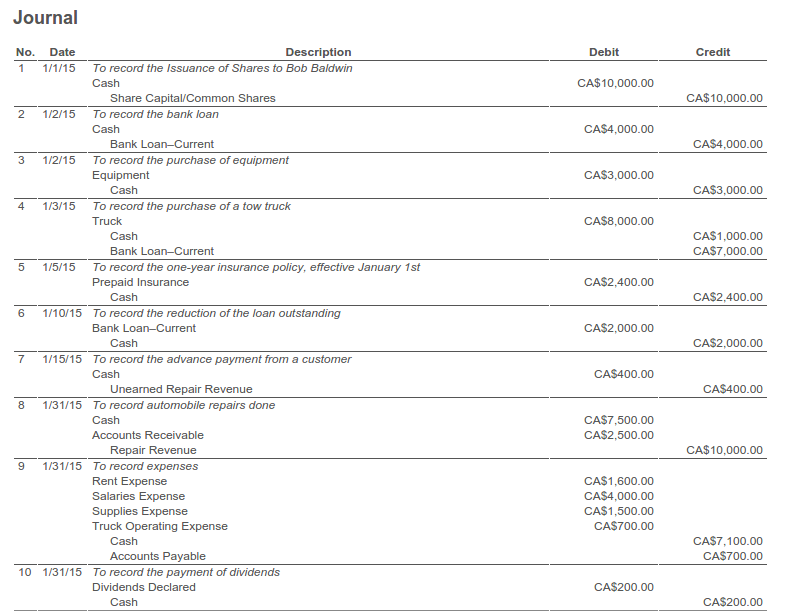 If we are curious, we can have a look at the Chart of Accounts, just to check that there is one. 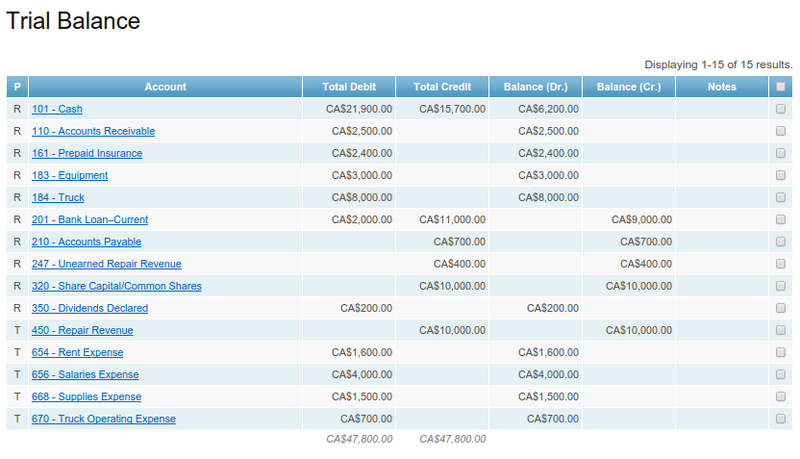 We can notice that the accounts are grouped in categories and ordered by codes. We might guess that grouping is done by codes (Petty Cash is a child of Current Assets because the first part of its code, up to the last dot, is the same), and we would be right. For each account, there is a position (P for Permanent Accounts, T for Temporary Accounts, etc.) and an ordinary Outstanding Balance, that can be used for some checks (for instance, it wouldn't be normal that Petty Cash has a credit outstanding balance, would it?). We can create a new account, we can import accounts (copying and pasting from a spreadsheet, for instance), we can export our accounts list, we can synchronize our chart of accounts with the one of the firm we forked our one from. By the way, this is why when we create a firm we don't "duplicate" it but "fork" it: a link to the parent firm is kept so that, if the chart of accounts of the parent firm is modified, we can easily import the changes. 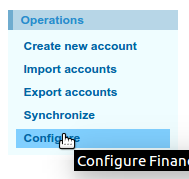 The last operation, Configure, takes us to a section of the program where we can have a look at how the accounts are, not surprisingly, configured. define which statements we want to be able to prepare. We can also have a look at the General Ledger, at the Trial Balance and at the Statements, which are prepared with the available data. 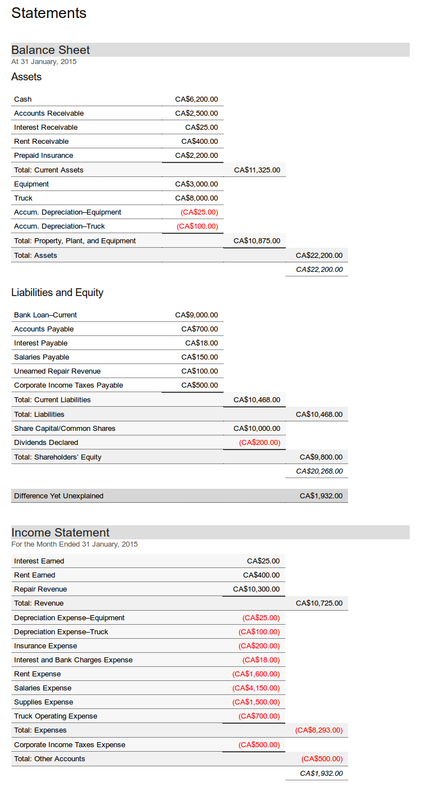 Most of the data show on page 55 of the book is now available, and in fact we can get auto-generated Income Statement and Balance Sheet from it (don't look at the Statement of Changes in Equity yet). They are not perfect yet (you may notice that there is a line stating Difference Yet Unexplained for $2,200), but we may be satisfied as we are finished with Chapter 2. The third chapter of the book, Financial Accounting and the Use of Adjusting Entries, deals with the operating cycle and with the concepts of revenue recognition, accrual accounting, matching principle and adjusting entries. If we go through pages 103–112 of the book, we find a detail explanation of why adjusting entries are needed and how they look like. Why is it unexplained? Simply enough, because there is no journal entry that explains it explicitly. In other words, there is a missing link between the Income Statement and the Balance Sheet (through the Statement of Changes in Equity, as we'll soon see). to close the Dividends account to Retained Earnings. This process is well described in §F, The Closing Process, of the book (pages 116-118). 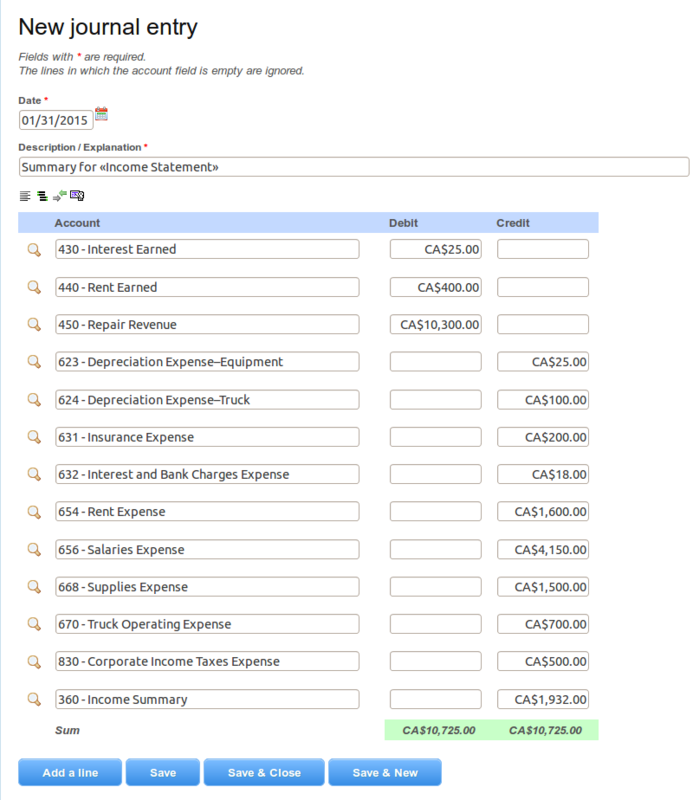 (The Income Summary account is automatically chosen because it is the only account that has a position code of lowercase t, and we are closing all the accounts with a position code of uppercase T). In the book there are two separate entries, one for revenues first, and one for expenses later. The net effect is the same, of course. Anyway, if we want, we can delete the rows concerning expenses, save the entry, and prepare a second entry for expenses. When we look at the journal entries, we see that the closing entry we just added is shown in green. This indicates that this particular journal entry does not have any effect on the statements that are shown in the Statements section. Why is that? 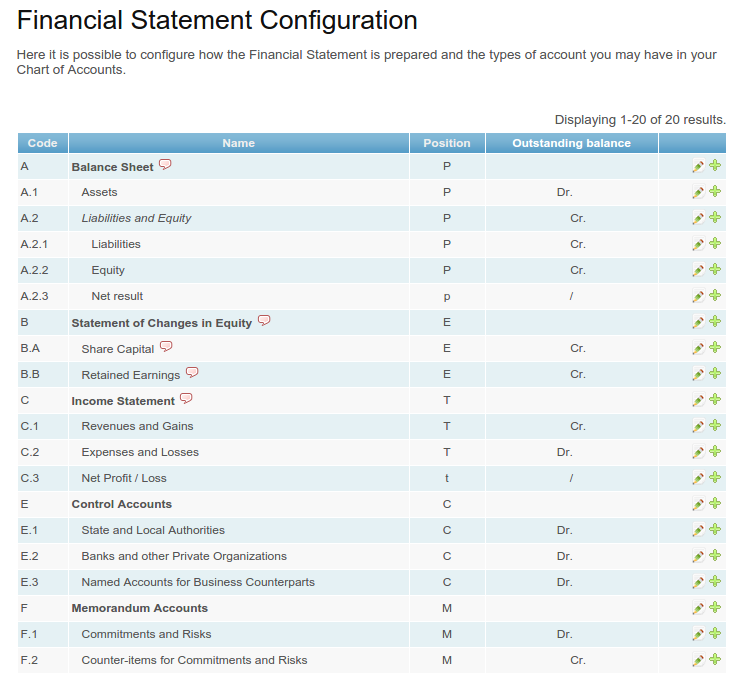 Because the application needs the amount of the balances of temporary accounts to show the statement (the Income Statement in this case) and, if the accounts are closed, the amount is zero; so it just excludes journal entries with this special status. The second and third entries are not automatically generated (but we will see in an upcoming blog post that we can have them automatically generated, don't worry), so we must prepare them in the traditional way (but we can press the ? 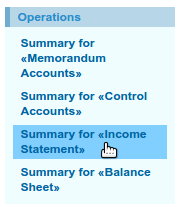 key on the keyboard, when we have the amount field selected, to automatically retrieve the amount that closes the Income Summary account). Now that we have journalized all the transactions and the adjusting entries and have completed the closing process, let's have a look at the statements. The Balance Sheet and the Income Summary do not present any surprise, because they look like they were before (but we may observe that there is not anymore a "difference yet unexplained", since the Retained Earnings are part of Equity and are shown in the appropriate place). How does the Statement of Changes in Equity look like? 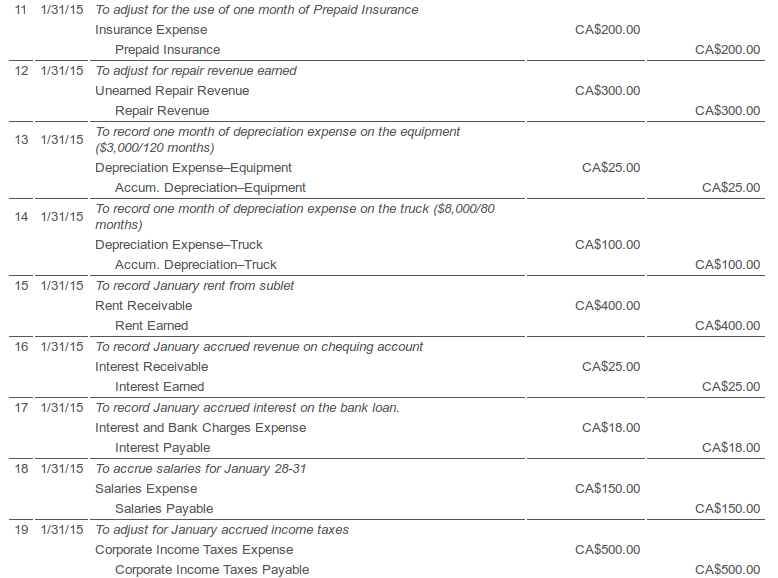 The amounts shown are not taken from account balances, like for the Balance Sheet and the Income Statement, but straight from the journal entries. You might recognise that the first column is filled with their descriptions, with the "To record" part stripped away. How is it so? The main point here is that the format is set to "Statement in analytic format": this means that the journal entries are analyzed to compute the needed data. The other two kind of formats (pancake format and two separate sections) are used for the Income Statement and for the Balance Sheet, respectively. a strip tag, in form of a regular expression used to replace some text from the journal entry description (you don't need to know how regular expression work to use them: it is enough to kwow that this particular one means that the application should replace every text that begins with "To" + a word, like in "To record", "To close", etc.). As children of the item Statement of Changes in Equity there are two other items, Share Capital and Retained Earnings, that represent the needed columns in the statement. Each of them, in the comment field, has the list of account to analyze (hence the name of the format of the statement). So, for instance, the first one has the following "analyze" tag, that tells the application to consider accounts with codes 320 (Share Capital) and 325 (Preferred Shares). Last thing, now. If we want to obtain better values for the first column, we can add extra comments in the journal entries involved, in the lines of the single postings (just put a hash sign after the account name, with a comment afterwards). This way, the comment is taken into consideration, instead of the journal entry description. We are done. If you have comments, corrections or hints, just write a comment here below in the blog or contact us through the form on the website. 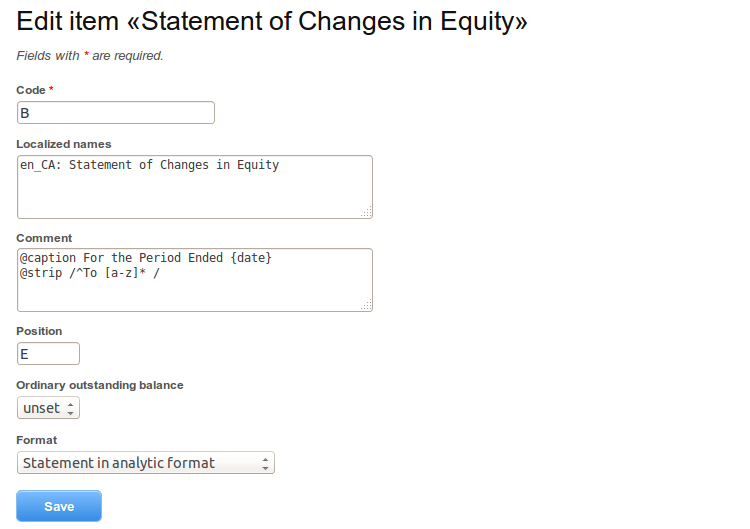 How to prepare a Statement of Changes in Equity on LearnDoubleEntry.org by Loris Tissino is licensed under a Creative Commons Attribution-NonCommercial-ShareAlike 4.0 International License. 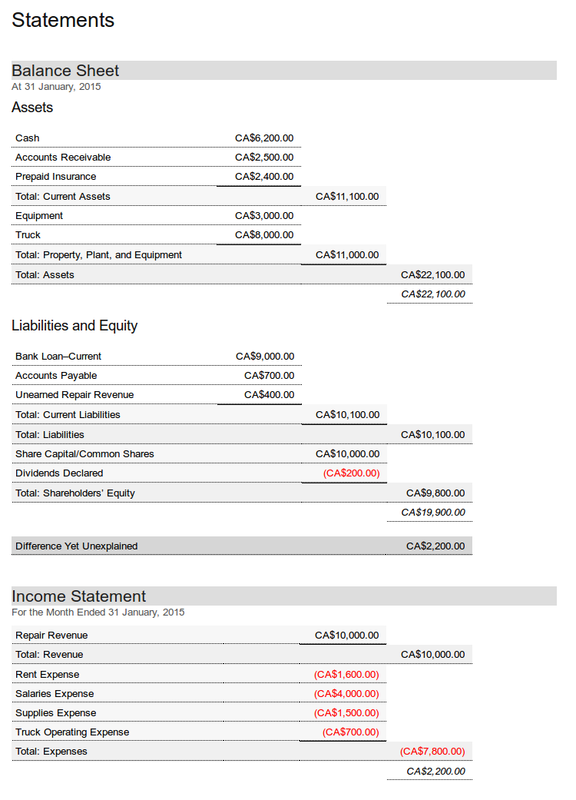 Based on a work at https://business.athabascau.ca/assets/Introduction-to-Financial-Accounting-online-text.pdf.